Goldfinger Law has some of the best ankle fracture lawyers in Toronto, London, Peterborough and the surrounding area. Ankle fractures are very serious, and rarely get back to 100%. They can occur in a variety of ways, but most frequently, our law firm sees ankle fractures in slip and fall cases, car accident cases, and other traumatic impact cases. The most common causes for ankle injuries in slip and fall cases is as a result of snow and ice accumulation on a poorly maintained surface. There are laws in Ontario to protect your rights as an injured party if you’ve slipped and fell on a surface which was not properly maintained. Sometimes ankles don’t break. Instead, we see ankle injuries where there are very bad sprains which have caused ligament damage. Ligament damage can sometimes be worse than breaking bone. Bones can heal, but ligaments may not, or may take longer to heal than bone. 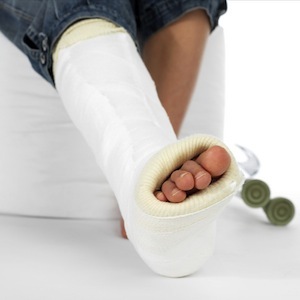 Ankle fractures are treated in a variety of different ways. It all depends on the nature of the injury, the age of the accident victim, and the surgeon responsible for the treatment of the patient. Sometimes surgery is warranted. Other times, surgery is not required. Sometimes people are put into casts, other times they are not. Again, it all depends, as every case is different, and every ankle fracture is different. Fractured Tibia: This is the larger bone on your lower leg, or the shinbone as it’s called. It connects the knee to the ankle. It forms a part of the ankle joint. Fractured Fibia: This is the smaller bone adjacent to the tibia. It’s also known as the calf bone. It too connects the knee to the ankle. It also forms a part of the ankle joint. Fractured Talus: This is called the ankle bone at the side of your foot. It too forms a part of the ankle joint. Fracture to the Medial Malleolus: Lower part of the tibia. Talk to your orthopaedic surgeon if you sustained damage to any part of your malleolus. It’s never good. Fracture to the Posterior Malleolus: This is the upper part of the tibia. Fracture to the Lateral Malleolus: This is the end part of the fibula. If you’ve sustained a fractured ankle, or serious ankle sprain, you might have heard a “popping” sound at impact, or felt a pop or felt a tear. This is not uncommon. The ankle may swell right away, or within the first 24hours following the accident. There may be bruising, or discoloration of the ankle and the foot following the trauma. The ankle will likely be tender to touch, and it will be difficult to walk or put weight on it. In extreme cases, the bone may be completely dislocated causing a deformation of the foot or ankle joint, or may even pierce the skin. All of these symptoms will likely be associated with extreme pain and agony, which may even cause a person to pass out following the accident. Ankle fractures can be treated with a closed reduction. This is when doctors use manual pressure to try to get the ankle and the bones back into place. They will then place a hard cast on the ankle to set it into place and hope that it heals. Other times, doctors will operate, and insert metal plates and screws to keep the ankle in place. This hardware may be removed from the ankle after a period of time, or it might be left in the ankle permanently. Doctors tend not to like putting in hardware into more elderly injured parties because there is a greater risk of infection and surgical complication. In the most severe and extreme ankle fracture cases, doctors will have no choice but to conduct an ankle fusion or total ankle replacement surgery. Talk to your orthopedic surgeon about this as these procedures can be very invasive. When hardware has been inserted into accident victims, it’s not uncommon for the hardware to break, get displaced over a long period of time, or need to be removed/adjusted. Our clients find that the hardware causes pain and numbness after prolonged walking, standing, running, jumping, wearing high heels, when it gets really cold, or when it rains. Following the hardware removal, our clients have expressed to us their difficulties with getting the foot and ankle joint back to 100%. Our clients endure countless hours of physiotherapy, occupational therapy, strength and conditioning programs to their strength and flexibility back to their ankle joints. The road to recovery following an ankle fracture, or torn ligaments in the ankle is never an easy one. Part of the reason is the ankle joint is so complex. Another reason is that whenever you stand or walk, you’re putting pressure on that ankle joint, so it’s always at work when you’re standing. If you’ve sustained an ankle injury, call the law firm that’s helped countless of Ontarians recover millions of dollars for their ankle injury cases. Our law firm would be pleased to assist you any way that we can. Call us for your free consultation with one of our injury lawyers.